Encompassing four-city blocks, the downtown arena is an indoor multi-use facility. The proposed project includes 137 residential units, 72,000 square feet of retail space, and rooftop terraces and outdoor patios. The proposed streetcar system would connect the West Sacramento Civic Center and Raley Field with Downtown Sacramento. The 240-acre Railyards is the largest infill development site in the U.S. The proposal includes residential, hotel, and commercial uses. This community for artists is a reuse of the historic Lawrence Warehouse that includes 116 apartments, and ground floor retail. Look ahead at the development projects that are transforming downtown’s landscape. Downtown Sacramento is constantly evolving. Over the past decade, more than $1 billion in public and private investments were made in Downtown and that is just the beginning. Explore downtown development activity, use the search tools below to browse by name, status and type. Project sq. ft: 50,000 sq. ft.
Project sq. ft: 300,000 sq. ft.
Project sq. ft: 370,000 sq. ft.
Project sq. ft: 406,382 sq. ft.
Project sq. ft: 800,000 sq. ft.
Project sq. ft: 70,635 sq. ft.
Project sq. ft: 180,000 sq. 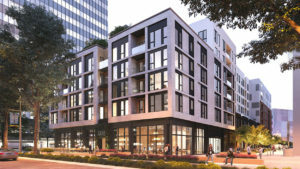 ft.
Plans are in the works to construct a mixed-use project consisting of 162 condominiums and nearly 5,800 square feet of retail. Looking for more specific info about downtown? We can help. From geo-targeted demographic reports and retail trends, to insights on downtown development projects, we are at your service.